This post is part of a series about the recently updated Volusion Enhanced Mobile Ecommerce. The first post in the series is Volusion Serves Up a Turkey with Enhanced Mobile Ecommerce. Mobile, mobile, mobile… we all know it’s about mobile devices and traffic. It is a trend that will continue because mobile devices will surpass desktops in the near future. For Volusion store owners you have two options: (1) enable their mobile storefront service, or (2) leave the option off and force the visitor to navigate through your store on the desktop version. As many of you have probably done, you have turned on the mobile version and are using Google Analytics to track your visits, interactions and conversions. However, did you know that when you turn on the Volusion mobile functionality within your store, you are effectively also turning OFF your Google Analytics tracking for your mobile store? Let me repeat that… when you enable Volusion’s mobile storefront you are also turning off any hope of tracking that traffic via analytics (Google or otherwise). Crazy, right?!!! Let me explain…. When you turn on your mobile storefront you are turning on another portion of your store and Volusion detects and redirects mobile device traffic to your mobile pages, which is served by a template you have no access to. 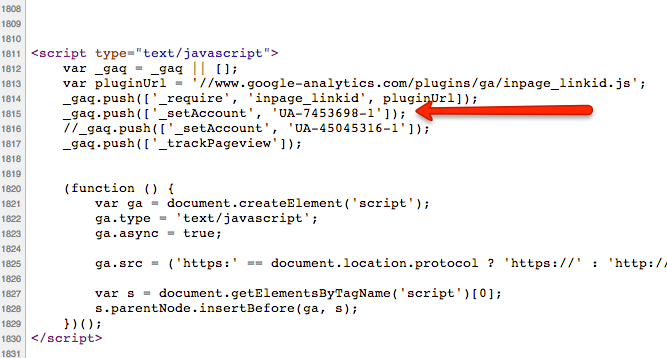 Because of that switch, your Google Analytics code is left off of mobile and only serves on the desktop version of your store. It is easy to prove, simply navigate to a mobile page of your store and view the source of that page. For example, if you navigate to a page like this: http://www.eastcoastvapor.com/mobile/product.aspx?id=38295 and View Source you’ll see there is no GA coding. Without that GA code your analytics simply stop once a visitor switches to the mobile experience of your store. Every click and interaction with your mobile store is lost. You have no way to monitor it, track it or analyze it. Hey, I know what you’re thinking. 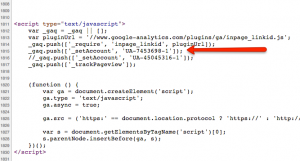 You’re going to say that you can see the mobile traffic in your store in via your Google Analytics. But can you really? Yes, you are seeing mobile traffic. However, you are only seeing mobile traffic to the desktop version of your store. You are NOT seeing a single visit from a mobile device that has visited a mobile page in your store! 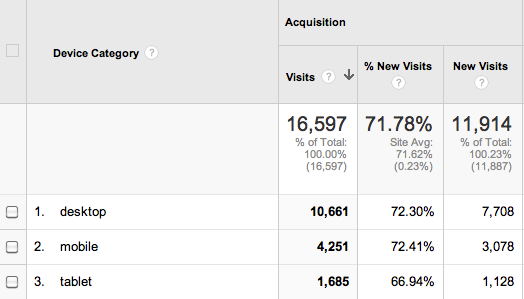 In other words, GA is only capturing non-mobile storefront traffic. And we can prove it with a simple advanced segment. Add this segment to your store: Volusion Mobile Page Visits (this will automatically add the segment to your Google Analytics). The custom segment will show you all traffic that has /mobile/ in the URL. See? Nothing… nada… zip. The only “mobile” traffic you can see in GA is visits from devices that use the desktop version of your store on a mobile device. Click on your product URL. This will take you to the desktop version of the product page because naturally Volusion’s mobile implementation is so bad that they don’t even redirect you to the mobile page when you’re on a mobile device. Click on your logo or homepage link. This will navigate you to the home page of your mobile storefront. But guess what? 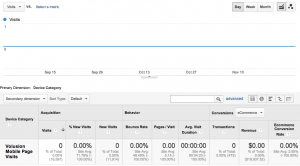 From GA’s perspective, you just bounced in analytics! 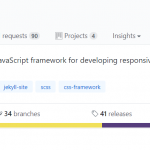 You landed on a page and stayed on the same domain but because there’s no GA code installed on the mobile template it will appear as a bounce in your analytic report. How many bounces in your store are false because of Volusion? Can it get any worse? Unfortunately yes…if at any time you jump from the mobile storefront to the desktop version, Google Analytics will a) count the desktop page as the “landing page” and b) will count that as a direct visit instead of an organic visit. Destruction of your analytics is in full force with Volusion running your mobile storefront. With the new mobile storefront, Volusion has introduced a new, mobile-optimized checkout cart and checkout pages (actually, the cart and the checkout are all combined into one page at www.yourstore.com/checkout.asp). Of course the simple solution to this problem would be for Volusion to allow you to add your GA code so you can monitor your mobile traffic. Unfortunately, not only do they not offer this but they are adding in their own Google Analytics code to monitor the checkout process of YOUR store. Doesn't look like your GA code, does it? 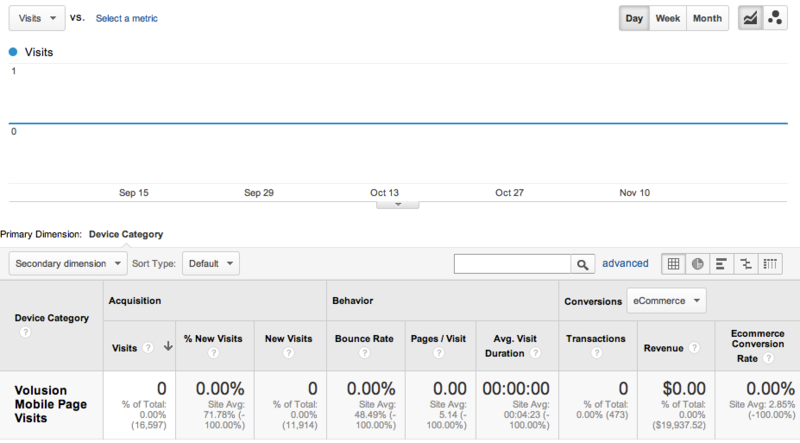 So, Volusion gets the analytics and you don’t. How does that feel? This is a devastating flaw in Volusion’s mobile execution. As a Volusion store owner you have no way to measure engagement and conversion of your mobile traffic. You have no opportunity to improve the experience and identify issues of this major traffic segment. Knowing this information, if mobile is 35% of your overall traffic and you’re using the mobile storefront, how reliable is your analytic data now? 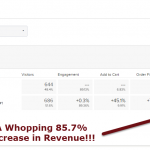 Your Google Analytics revenue will never match your Volusion revenue because of this. You cannot fully understand how well your marketing dollars are being utilized. When will Volusion get it together? It is a simple fix. Make it happen Volusion.